The island does its primary grocery shopping on Wednesdays, as that’s the day after the ship comes in and time to distribute all the goods out to the markets in each village. Yesterday, I picked up a case of water, hefted it onto my shoulder, packed my backpack chock full of groceries and started hoofing it home. No sooner had I stepped out of Windwardside when it started to rain. Usually, these are burst showers…five minutes max. Not my luck. It rained…hard…the whole walk home, my feet slipping and squishing for traction as I climbed the ascents. Ronnie Johnson, the owner of the Big Rock Market where I’d come from, offered me a ride a couple hundred yards away from the cottage, but by that time I was committed to finish. 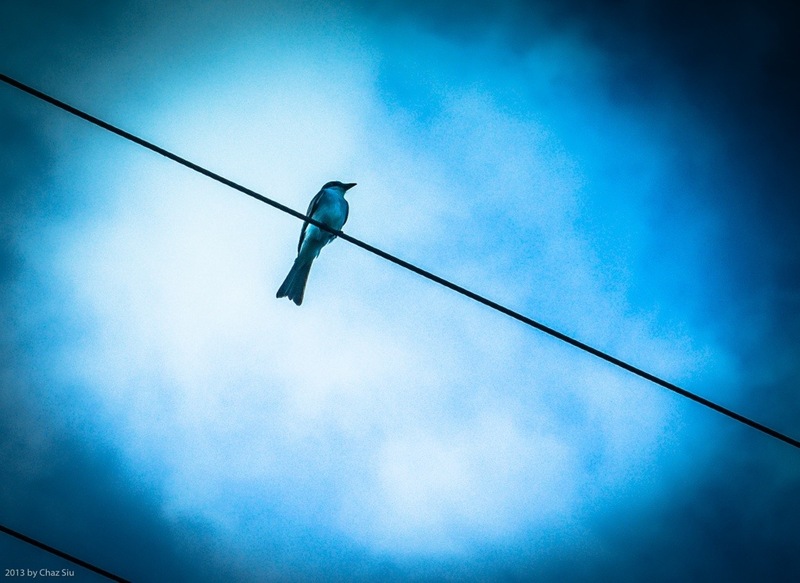 Later that day, I meandered up the long mountain road above Windwardside, the skies threatening again, and this little fella was chirruping madly up there, all comfy on his wire. Even bird egos need their picture taken, I s’pose.